This December, our preschoolers are learning that Jesus can do anything! Watch this video and then take a look below at each week and the specific story your child will hear. As you scroll, you'll also see a few downloadable resources that you can use to help continue the conversation at home with your kids. Preschoolers love showing us what they can do. They are full of WATCH THIS moments. And it can be anything – turning in a circle, running and jumping on a pile of pillows, curtseying like a princess, or making their eyebrows go up and down. Pretty much anything a preschooler can do falls into the WATCH THIS category, simply because they think anything they learn how to do deserves a WATCH THIS moment. This month we’re going to run with that theme and the words ‘WATCH THIS!’ will be said... A LOT! For all of you science experiment fans, you’re going to have a blast! Any messes that will be made will be TOTALLY worth it. We want to invite preschoolers to WATCH THIS as we do a few impressive things so we can lead them to the ONE who can do ANYTHING! 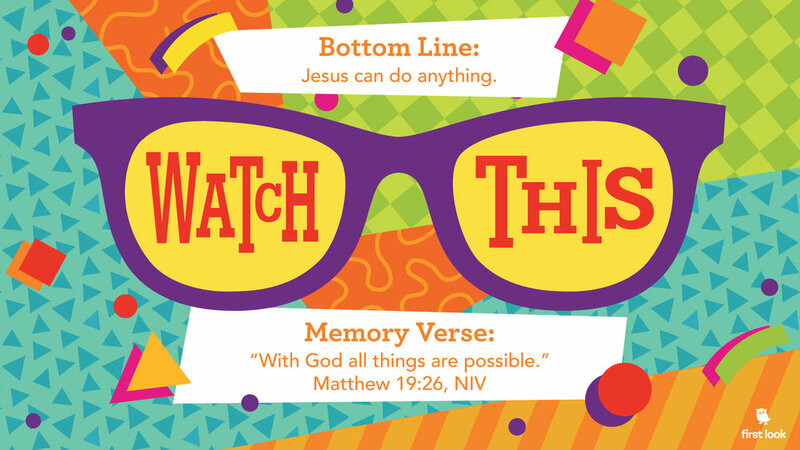 The goal for this month is to learn that Jesus is the one to watch, because JESUS CAN DO ANYTHING! January Cue Sheet - Parent Cue Sheet to give you ideas of things to do with your children at morning time, bath time, car time, play time and cuddle time. Memory Verse - Our verse for the month and the hand motions that your children are doing each Sunday to help them remember.